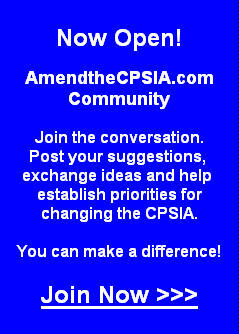 Share your viewpoints regarding the recent CPSIA decisions. Rick is a "very cynical . . . special interest". The banal and almost unnoticed adoption of ASTM F963 as a mandatory standard at the July 20th Commission meeting seems so innocuous. Is it, really? "I joined in the majority’s vote only because of a negotiated agreement that we would stay enforcement of the testing mandate through December 31, 2011. Had we not reached this compromise, the testing requirement would have landed in the market’s lap in mid-October, just as stores are making their final preparations for the holiday season and small toy manufacturers are at the peak of filling orders. While I am relieved that companies will now have some time to find their way through the maze we have created, I have major concerns about why we are rushing to impose testing requirements to a standard we know is about to change." What was that last bit? Ummm, well, the ASTM is actually updating the F963 standard right now. It will be done by year end. and as a result of the CPSC's wondrous action this week, it will be a mandatory rule to test to an obsolete standard on January 1, 2012 - and probably necessary to test to the new standard, too! Doesn't that sound great?! Now you can deliver TWO test reports when one might have sufficed. But think of how much safer kids will be if you produce two almost identical passing test reports rather than just one. Just think of it . . . .
"When the stay of enforcement is lifted on January 1, 2012, most likely we will be requiring testing to an outdated standard. This puts manufacturers and retailers potentially in the situation of having to do redundant or perhaps irrelevant testing – testing mandated by the CPSC to the old standard and testing mandated by the marketplace to the new standard. Because we are taking the position that these testing requirements are rules and can only be changed (after August, 2011) by notice and comment rulemaking, there is virtually no way to get the new notice of requirements in place and labs accredited before the standard becomes effective. This puts toy manufacturers in an untenable position. Our response is that we will address these problems as they come up but, of course, in the real world, this is no response at all to the potential for confusion we are creating." I no longer have a sense of humor, so you can rest assured that I am NOT making this up. "We are able to issue this NOR [notice of requirements] without following the Administrative Procedures Act (APA), with its notice and comment requirement, because the CPSIA allows avoiding the APA until August 14, 2011. After that, we must ask for and consider public input. Therefore, by putting out the NOR today, (1) we did not need to ask for and consider public comment, but (2) we did need to stay enforcement to prevent an unnecessary economic train wreck for the toy industry immediately prior to the holidays." Does anyone remember that Bob Adler has said publicly at several Commission meetings and hearings that he hates stays and doesn't want to vote for any more stays? So this vote avoids a public hearing and public comment (takes time, increases scrutiny, can limited flexibility) and it also avoids another stay process to extend this misery. The Dems on the Commission almost always vote as a pack. Can you connect the dots? "However, if we waited, as sound regulatory policy would direct, we would have had to seek comments from the public. Apparently this public input process is too much of a burden for the agency, so if we have the opportunity to skirt the requirement we are more than happy to do that. Like a teenager with dad’s car keys, we want to squeeze in as much joy-riding as we can before the curfew hits. Our hasty decision does not achieve a net safety benefit, but it unfortunately does make things much more difficult than they need to be for the companies that are trying to understand and follow the law. . . . With its vote today, the CPSC has once again opted for rash action over rational action, to the quick and easy over the thoughtful and transparent. We know how to do better rulemaking; unfortunately, the majority today decided to push the ‘quick’ button instead of the ‘pause and think’ button." Another Commission decision, another shellacking of the poor fools left serving children's markets. After three years of this torture, I am just not surprised. When will our country wake up and notice this travesty? CPSIA - Futile Provision or Gimme for Big Biz? Rick Woldenberg, Chairman - Learning Resources Inc.
Learning Resources manufactures multi-sensory classroom materials and educational toys that engage, inspire and motivate. Educators trust our award-winning products to supplement instruction in reading, math, science, early childhood, Spanish, ELL and more. Our products include center-based kits, manipulatives, pocket charts, classroom management tools and teacher resources that help busy classrooms run smoothly. CPSIA - That's all, Folks! CPSIA - No Surprise - Bipartisan House Bill Passes 421-2. CPSIA - CPSC Punts on "Material Inaccuracy"